But also, food I have never seen before. New things. Every week. 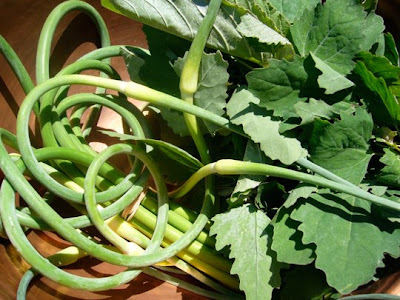 Like these, garlic scapes, at left. Softer, greener, garlicky flavor. Nice. And the greens. I got these from the Thai family that sells at the market. I have no idea what they are. The only explanation I got was, "We cook it with fish. There is no English word for them." Sold. Oh, they were good with fish, too. You can substitute baby bok choy or spinach. If I knew what the greens were, I'd be planting some! Place the sauce ingredients in a small sauce pan and heat to a boil. Reduce heat, and simmer until sauce is reduced and thickened, about 15 minutes. Heat oven or grill. For oven, 350 degrees. Lightly oil the fish and salt and pepper. Bake for about 20 minutes or until fish is firm, opaque and flakes easily. Heat the rest of the canola oil in a skillet, medium high. Add the garlic and saute for two minutes. Add the greens and saute just until wilted. Serve the greens on bottom, fish on top of greens and drizzle on sauce. The sauce is also excellent for stir fry, such as asparagus. If anyone knows the name of these greens, please tell me! But Do Kids Eat This? I've ranted about the idea of "kid's menus" and "kid food" limited to chicken fingers and mac and cheese are a myth before, so no need to go into that here. Did mine eat this? Definitely, and once her serving was finished, she ate most of mine for seconds. You just never know if you don't try. Even if sometimes you don't want to. Like the evening my spouse and I treated ourselves to a pound of wild caught salmon he smoked on the grill. The kiddo eyed her pork and noodles, pushed it away, and said, "I want THAT!" pointing at our $30-a-pound-once-a-year luxury. We looked at each other. Should we? I forked over a couple bites. "I like it!" Kiddo exclaims. Of course she does. Good food really doesn't have an age limit any more than someone telling me I'm too old for an ice cream cone. 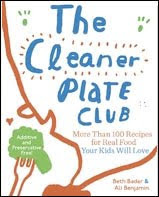 A couple tips on giving fish to your child, however, make sure it is one of the more sustainable choices for the environment, and for things like mercury contamination level. You can get a lot of information on this from Monterey Bay Aquarium's Seafood Watch. 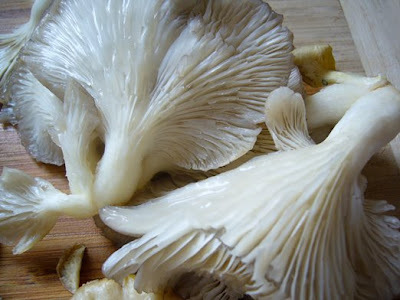 Our first CSA box this year held a nice surprise, oyster mushrooms. I decided to take a very light hand with the recipe for these. Melt the butter in a skillet. Add the shallot and cook one minute. Add the mushrooms and cook another five minutes. Add the peas. Cook another 2 minutes. Add cognac, let liquid get absorbed, about another minute. Finish with salt, pepper, and the fresh tarragon. Toss with the pasta and grate the cheese over the top.